What Are The Common Side Effects Of Over The Counter Sleep Aids? 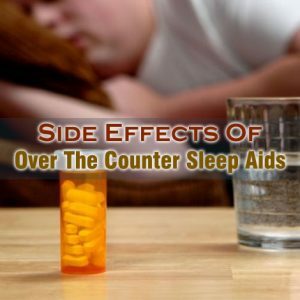 Home > Sleep Disorders > What Are The Common Side Effects Of Over The Counter Sleep Aids? A large number of people suffering from insomnia generally turn to the use of over-the-counter sleep aids that can help them in sleeping better. Though, over-the-counter sleep aids can work magically in getting a good night’s sleep, they do not serve as ideal treatments for the ones suffering from chronic insomnia. Different over-the-counter sleep aids are available without prescription and they are generally considered very safe. However, it is always important to consult a pharmacist regarding the side effects of over the counter sleep aids. You should be very careful when taking them because most OTC sleep aids contain antihistamines and tolerance to sedative effects of antihistamines can develop very fast. According to the Food and Drug Administration, over-the-counter sleep aids should not be used for more than two to three weeks. This is because they are habit forming and an individual might get addicted to them very easily. People who are addicted to the use of over-the-counter sleeping aids face withdrawal symptoms when they try quitting this habit. The withdrawal phase might get very difficult for an individual to cope up with. Hypotension is also one of common side effects of over the counter sleep aids. Hypotension is a condition of experiencing abnormally low blood pressure. This condition might be very dangerous for the health of an individual just like high blood pressure. Over-the-counter sleep aids might result in the inability of getting out of bed in the morning. This is because individuals using OTC sleep aids seem to be too drugged up. It is therefore quite important to take the OTCs in limit. Fatigue and daytime drowsiness are also some of the most common side effects of over the counter sleep aids. These conditions can result in poor performance at work and studies along with drowsy driving resulting in accidents.